There’s been a lot of online chatter lately about a new report from Consumer Reports about the level of arsenic in rice. Read it yourself, but suffice it to say some kinds of rice contain an unacceptable level of arsenic in my opinion. Things can be done. There’s a petition asking the FDA and EU to set arsenic limits for rice. It really needs signatures, as progress has been slow. The big problem is with inorganic arsenic, which gets into the soil due to pesticides and fertilizers containing it. There are ways growers can grow rice with less arsenic and not suffer from lower yields. 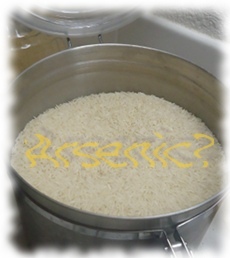 You can take steps to decrease the arsenic in any rice you eat as well. Rinsing your rice for three minutes, and cooking in 6 parts water to 1 part rice can help. Certain varieties, such as basmati and jasmine also contain less arsenic. Makes me glad that those are the varieties my husband prefers anyhow, although I need to check the source, as that matters too. India, Thailand and California rice usually have less arsenic. Also pay attention to the intake limits recommended by Consumer Reports.